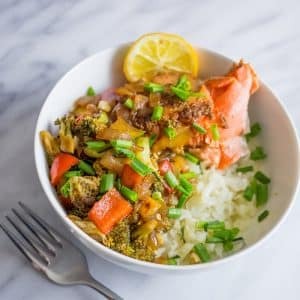 Easy and delicious One Pot Irish Whiskey Glazed Salmon Recipe is a quick and delicious one pot dinner that is bursting with Irish Whiskey flavor in just one pot! Perfect for low carb and keto diets, and impressive enough for a romantic date night or dinner party. One of my favorite things to eat in Ireland is all of the rich, delicious, and super-fresh seafood. Its healthy, low carb, and full of buttery flavor that is so comforting – it just can’t be beat! 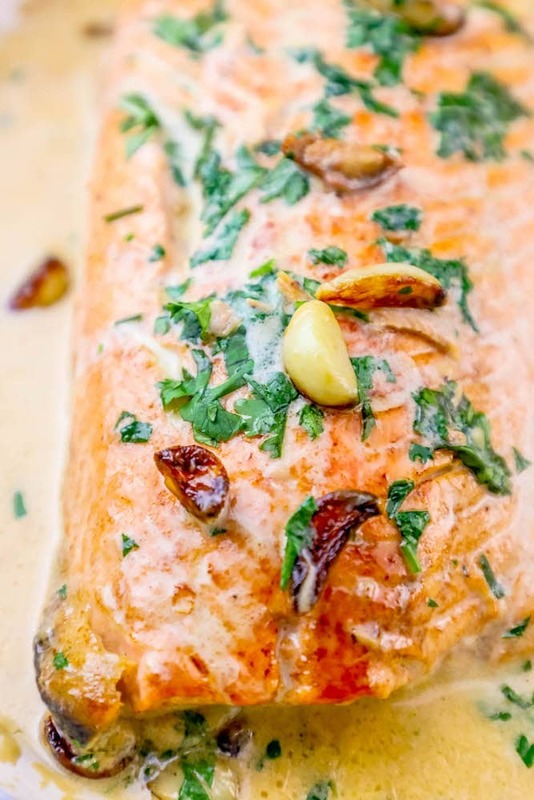 My last trip in Ireland, I had an amazingly delicious Irish Salmon with Cream Sauce, and knew I needed to immediately come home and make it. 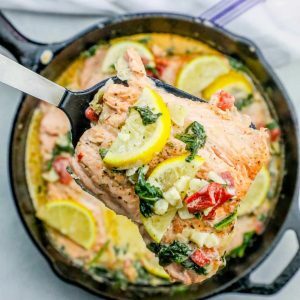 I worked with the recipe for a while to make it absolutely perfect – and in testing it out, I kept getting sick of making salmon in one pan, and the sauce in the other – and came up with this easy and quick method for a perfect salmon and cream sauce that is made all in one pan, in under 15 minutes! This is the perfect filling meal to celebrate Saint Patricks Day and all things Irish food…. it is sure to be one of your favorite new dishes! If you’re not sure of cooking with whiskey (remember that even if you cook the alcohol, it never completely burns off when cooking) – it does mostly burn off, making this a dish the whole family can enjoy. We’re flambéing the whiskey in this dish to take out some of the heat from the sauce, and leave the sweet, caramel flavor that pairs perfectly with thick cream and salmon’s slightly sweet taste. If you want to know how to make whiskey sauce, you’re in luck! It’s incredibly easy, perfect over salmon, and looks and sounds impressive – without taking much time! 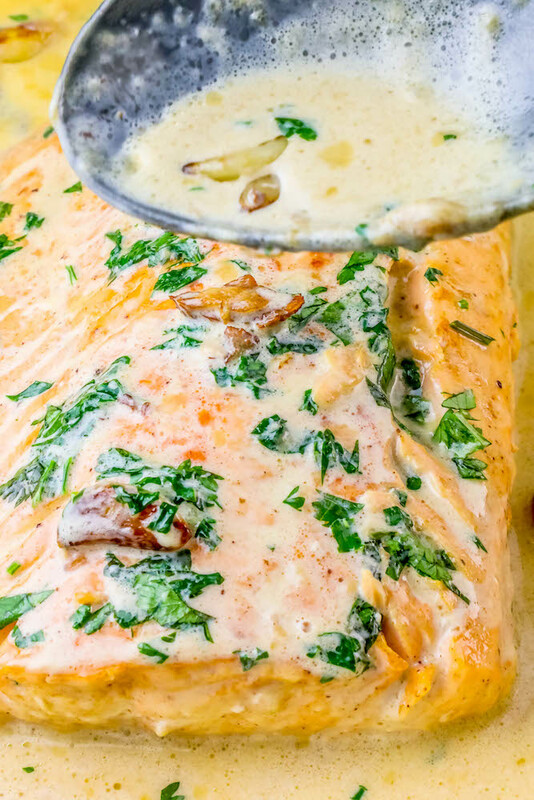 A delicious creamy whiskey sauce is a great way to dress up a dinner for a romantic date night or a dinner party – and can be done in the same pan with your Irishsalmon, so there is less to clean up after! I love the rich, buttery flavor of whiskey that has been ignited. It is sweeter, richer, and has a lovely buttery flavor and takes away the “hot” flavor of alcohol. When flambéing a sauce, it can be a bit dangerous since you want high heat and a big flame to burn off the alcohol – and alcohol, fire, and heat are a bit of a tricky combination. This is NOT something to mess around with – it is absolutely imperative you consider safety first when making this recipe. I make this often and love to make a sauce – and it is really, really easy to be safe when lighting alcohol on fire for cooking, so please take these tips into your consideration. Do NOT stand with your face over the pan when lighting the whiskey sauce on fire – this is a MAJOR must. Stand back, with your face out of the way of the pan, in case something lights faster than you want, in case there is a splash, etc. I use long handled matches so my hands are at a safe distance, in case something splashes, moves, or lights fast – unless you regularly cook with alcohol over a flame, please do not try to light it using the stove’s flames (if you have a gas stove) like you see chefs do on tv – they do these over and over hundreds of times and are used to recipes they are making, know to anticipate splashes, and know how to quickly deal with an alcohol fire if needed. Do NOT do this at home. When making a cream sauce, I always turn the heat off when adding in cream. 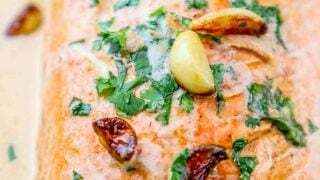 If you’ve ever had a cream sauce break, and wondered why does cream sauce break or how to fix a cream sauce that separates, you can make a cream sauce that won’t separate by turning the heat low or off when adding the cream, and whisking vigorously when adding. When the cream has been incorporated well and mixed, return the heat and continue cooking. If you love to cook (and drink), it can be a bit confusing to know what alcohol is perfect to cook with – especially when using something as expensive as Whiskey. I know it can be intimidating to buy a nice bottle of whiskey (and quite an investment) if you don’t love to drink it, but you do not want to buy something cheap, or whose flavor you don’t like, when making this dish. Using something with artificial flavors, too much of a Vanilla flavor, or a peaty profile like smoky Scottish Whiskey from Islay can throw your flavors in this dish off. I also recommend Jamison, Knoppogue Castle, or other slightly sweet, unpeated Irish whiskeys. If you don’t care if you’re using something Irish, I’d use Makers Mark, Breckenridge Bourbon, or a mid-range American/Scottish whiskey that isn’t too sweet or smoky. 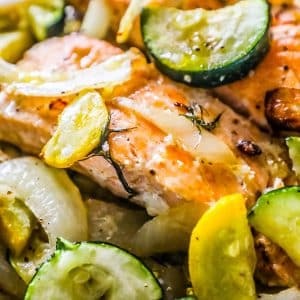 While this easy Irish salmon dinner is super easy, there are a couple of essentials you need to be sure to have a perfect, easy dinner without all the fuss! I’m sharing a couple of my favorite products that I used when making this recipe extra delicious! These Amazon affiliate links give me a small commission when you order from them, at absolutely no cost to you! 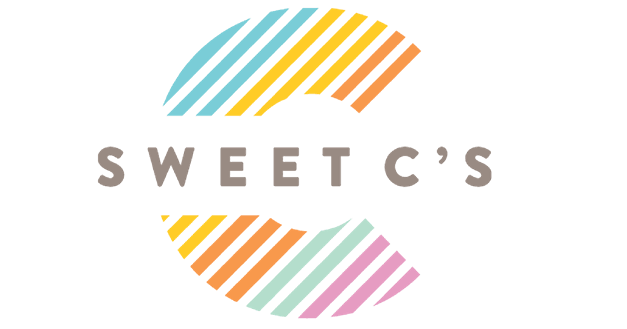 This helps me offset the costs of running Sweet C’s and helps me bring you totally free content. I like to flambe my Whiskey Sauce – which can be a bit dangerous if you don’t have long matches or you’re used to igniting alcohol over a flame. I prefer to use long matches (like the campfire kind), so my hands can be out of the pan in case it flames up too fast. You want the fire to burn hot and really fast, with the heat up high, so be sure to be careful and have matches that make it easier for you! 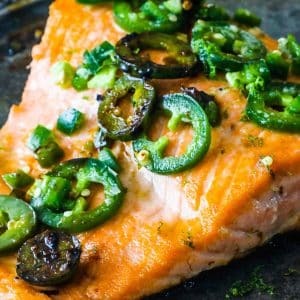 If you love this delicious easy salmon dinner, please check out some of my other easy seafood dishes! Click each link to get to the easy printable recipe! 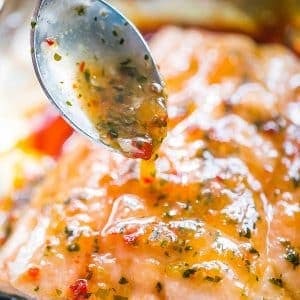 If you love this One Pot Irish Whiskey Glazed Salmon as much as I do, please write a five star review in the comment section below (or on Pinterest with the “tried it” button – you can now add pictures into reviews, too! ), and be sure to help me share on facebook! In a large nonstick pan, heat butter on medium high. When butter is melted and foamy, add salmon, face down, to pan. 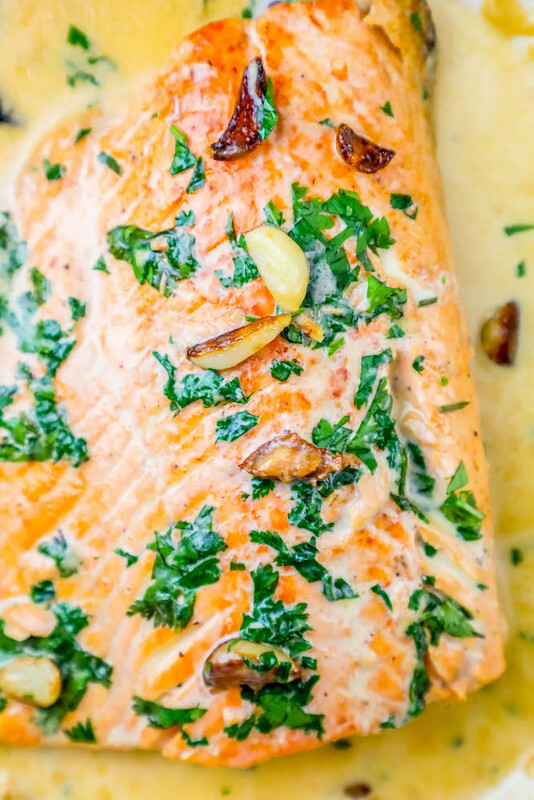 Cook salmon for 3-4 minutes, until slightly browned and crispy on top, when garlic is fragrant and softened, browned slightly. Carefully flip salmon to skin-side down. Pour in whiskey and carefully light with a long match. When whiskey flame has died off, turn heat off and push salmon and garlic to one side of pan. Add cream and whisk vigorously to incorporate with whiskey. Turn heat back to medium high and continue cooking salmon until opaque, ladling sauce over salmon as it finishes. 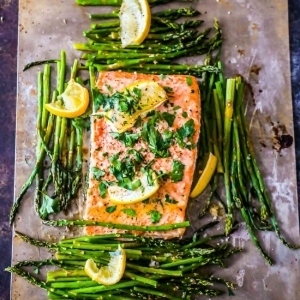 Set salmon on serving platter or dishes, and turn heat on sauce up to high to reduce for 1-2 minutes. Remove sauce from heat and let set for about a minute - it will thicken slightly when not over heat. 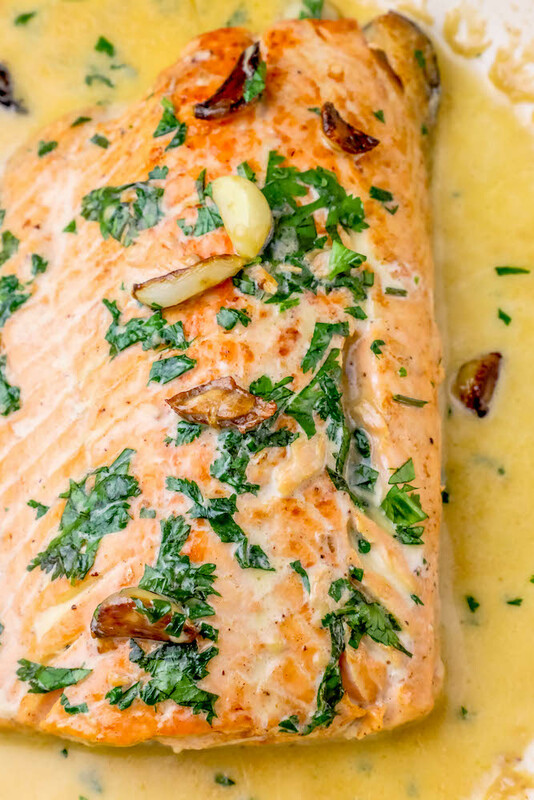 Pour sauce over salmon and serve immediately. We tried this once ourselves and it was so easy and delicious we are doing it again for a dinner party tomorrow night. Can’t wait to flambé with our guests! Wonderful recipe. This Salmon is unbelievable. We have made it twice now and it will be a staple! I think my grandchildren will talk about this dish- ha! My 1 year old daughter also LOVES it! This meal is easy and quick! Talk about impressive! Cannot wait to have guests over and light this shite up!